The 2017 ITTF Africa Cup concluded on Monday 3rd July in Agadir, Morocco; Nigeria's Quadri Aruna came through the Men's Singles competition with a smile on his face following a terrific effort to see off the top seed Omar Assar in the final (11-7, 3-11, 11-8, 4-11, 11-8, 8-11, 11-9). Victory in Agadir sees Quadri Aruna book his spot at the Liebherr 2017 ITTF Men's World Cup, representing Africa on the world stage once again. Regarded as two of the continent’s strongest players Quadri Aruna and Omar Assar often produce a wonderful spectacle on the table; the spectators in Agadir weren’t left disappointed as the top two seeds played out another thrilling match. Quadri Aruna enjoyed the better start in the final and held the early advantage after claiming two of the opening three games. Egyptian star Omar Assar fought his way back into the match, winning the fourth game to draw the tie level, and while Quadri Aruna managed to retake the lead with his success in game five the top seed from Egypt hit back once again to force a deciding seventh game. 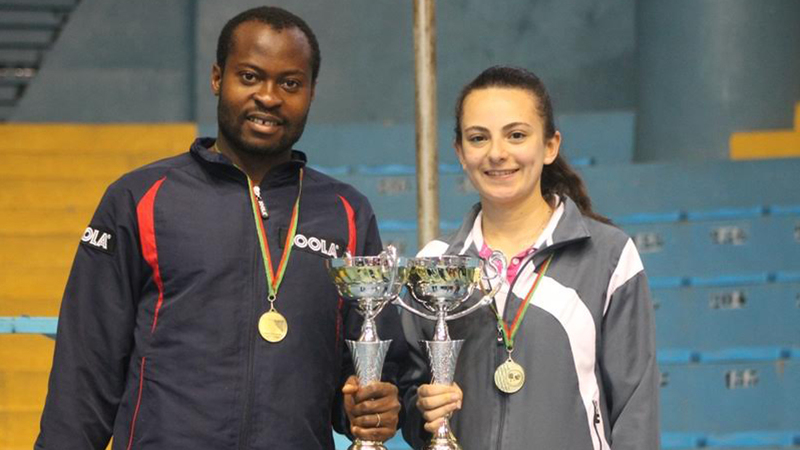 Both finalists had put in strong shifts in front of the Agadir crowd, but only one player could emerge victorious and that turned out to be Quadri Aruna after the 28-year-old edged over the line by the closest of margins to arrest the title (11-7, 3-11, 11-8, 4-11, 11-8, 8-11, 11-9). “I am so happy today that I won because it was not an easy match. I am happy that my backhand worked well in the match because I was afraid to use it against my friend – Omar Assar whom I know was in his best form this time. I think Omar Assar played well and that I was just lucky today because sometimes luck plays a crucial role in our matches”, Quadri Aruna. Joining Quadri Aruna and Omar Assar on the Men’s Singles podium is former champion Ahmed Saleh of Egypt, who ends the tournament with a third position finish.